The Fish House History The Fish House specializes in fresh local seafood including yellowtail snapper, mahi-mahi, grouper, Florida lobster, and stone crab. Try our smoked fish - smoked right on the premises. Relax... Lay Back... Dig into our scrumptious conch-style cooking. We know how to serve seafood right! See what the reviewers have to say about us! 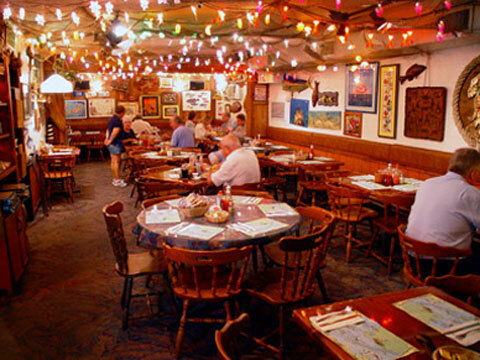 All of our dishes are served in a fun, friendly, and casual "Keys style" atmosphere. Start with our home made chowders, then select from our great menu of Conch Republic favorites - fresh seafood - Pan SautÃ©ed and Matecumbe Style, smoked fish, Jamaican Jerk or blackened fish dishes. And don't forget to finish your meal with a slice of our home made Key Lime pie! FRESH FISH is The Fish House's trademark, brought to the back door daily by fishermen, then filleted and prepared on premise... the finest in "Conch-style" cooking. The dining room is staffed by the friendliest, most efficient servers, in an informal, relaxed, "Keys-y" atmosphere. Proprietors. C.J. Berwick and Doug Prew, have owned and operated The Fish House since 1987, and many of "The Fish House Gang" have been there as long.